The funeral, which involved a traditional IRA guard of honour and saw shots fired over the coffin at his home, brought thousands of local people to pay their respects, as well as senior republicans of all shades. The Clongriffin man is understood to have been a senior figure in the (‘New’ or ‘Real’) IRA. A staunch opponent of drug dealers and criminal gangs in Dublin, the 32-year-old was gunned down in broad daylight last week yards from his home, evidently on the orders of the city’s powerful crime bosses. Questions were immediately raised as to the actions of the Garda police, who had placed Mr Ryan under continuous surveillance, but seemed to delay attending the scene of the cold-blooded assassination. There were also allegations that Garda Special Branch, the ‘intelligence police’ who later attended the scene outside Mr Ryan’s home, were seen to be celebrating his death. 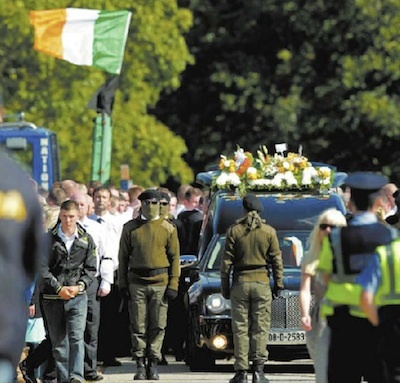 The funeral on Saturday saw an uneasy stand-off between republicans and Garda riot police, who had sought to limit the funeral’s IRA ‘trappings’. Following some negotiations, a gun salute did take place at Mr Ryan’s home, while an honour guard which accompanied the funeral cortege processed along streets lined with black flags and tricolours. Draped in the tricolour, the coffin was flanked by more than 200 supporters wearing the traditional republican uniform - a white shirt with black trousers and black tie. Hundreds more lined the road outside the church, where a traditional family funeral took place. Delivering an oration in Balgriffin ceremony, prominent Lurgan republican Colin Duffy described Alan Ryan as “a brave Irish republican and fearless IRA volunteer” who was dedicated to “fighting foreign interference in our country”. Mr Duffy also said that Ryan was under constant surveillance by “agents of the State”, a reference to the Garda Special Branch. “But on the day of his death the agents of the State were conspicuous by their absence, which is highly suspicious,” he said. He also attacked Ireland’s (mostly British owned) tabloid media, as ‘gutter rats’, and said they had smeared Mr Ryan both before and after his death. However, the high level of public support shown for Mr Ryan appeared to take the 26 County authorities by surprise, resulting in the biggest such funeral in the city in decades, with significant media interest. A subsequent radio interview on Tuesday between well-known chat show host Joe Duffy and a friend of Mr Ryan who escaped injury in the attack, fuelled the controversy. Paul Stewart suggested the Garda Special Branch had colluded in the killing, and described how Special Branch members laughed and mocked ‘the model’ as Ryan lay dead, and another friend of his lay seriously injured on the side of the road. However, he said many ordinary Gardai had also expressed their support to the family and had had no problem with the funeral, which he said was “a fitting send-off” for Mr Ryan. The clarity and apparent integrity of Stewart’s responses to Duffy’s questions increased concerns in the political establishment over the level of public support for ‘dissidents’, and provoked a reactionary response. The Garda arrest operation then began the following morning and by Thursday, 17 people were arrested in an operation which spanned Dublin and Leinster. Armed members of the Special Branch and the ‘Emergency Response Unit’ were involved in the raids, codenamed ‘Operation Ambience’, according to a Garda statement. Personal items such as cash and mobile phones were seized. Among the homes raided were Mr Ryan’s family home, where all of his brothers were arrested. A supporter of the family lambasted the “Guardians of the Peace” [Garda Suiochana, the Gardai] for their heavy-handed actions. He said they “kicked in the door and held guns to the heads” of all members of the family. “They tore the house apart manhandling Alan’s three brothers. All this in front of his little nephew who is now totally traumatised,” he said, adding that Mr Ryan’s mother had 700 euros in cash taken from her. The 32 County Sovereignty Movement also condemned the “pointless and vindictive” arrests. It said the Garda investigation into the 32-year-old’s murder was progressing with very much less urgency. “Following the funeral of IRA volunteer Alan Ryan the media have demanded that there must be punishment for the republican funeral Alan received. “Thousands lined the streets of Dublin and followed the funeral to pay their respects, they did so in a respectful, peaceful and dignified manner. “This must now be contrasted with the petty harassment meted out to the Ryan family and friends of Alan by An Garda Suiochana. The arrests had “exposed the agenda” of the Gardai, the group said. The funeral has polarised Sinn Fein supporters and republicans in the capital. There were claims that the displays had been used by the breakaway IRA organisations, now regrouped, to publicly claim the mantle of the IRA. Sinn Fein insisted they did not have support of the local community. Party President Gerry Adams condemned the activities of what he described as “groups involved in gangsterism and crime masquerading as the IRA”. He said they had no place in Irish society, and welcomed the Garda crackdown. “The [Provisional] IRA did the right thing on British resistance and when the peace process came forward,” he said.